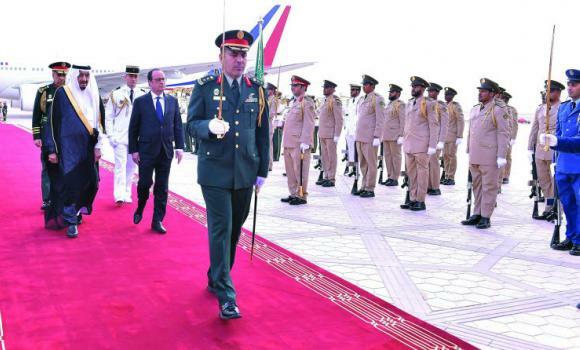 King Salman received French President Francois Hollande at Riyadh airport with a full guard of honour today. King Salman and President Hollande discussed the conflicts in Yemen, Syria, Iraq, and Libya besides other bilateral and regional issues, as well as focusing strongly on the nuclear deal with Iran. In the evening the king hosted a grand banquet in honour of President Hollande, who will attend the GCC consultative summit as guest of honour here on Tuesday. “King Salman and French President Hollande, in their wide-ranging talks, reaffirmed their mutual commitment to close defense, security, and commercial cooperation,” said a diplomatic source. On the crisis in Yemen, Saudi Arabia and France have similar positions. They have supported the GCC initiative that calls for holding discussions in Riyadh between the rival forces in Yemen. The GCC foreign ministers recently insisted that the possible peace-talks be held in the KSA, which has led the coalition in operation Decisive Storm since late March. President Hollande will make the most of his visit, taking in the historic Diriyah site before attending the GCC consultative summit on Tuesday.